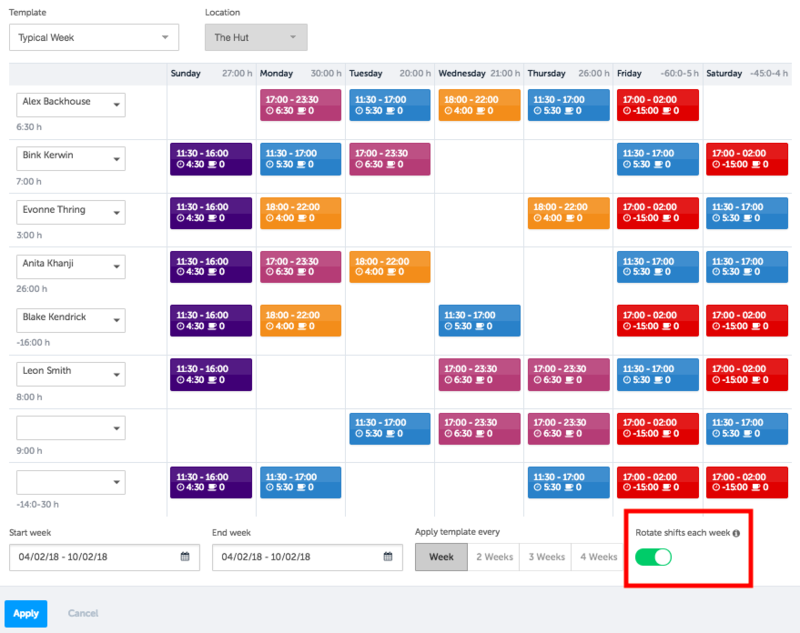 Once you've learnt how to Create, Edit & Approve a Basic Schedule, you can reduce the time you spend scheduling even further by using Rotageek's Scheduling Shortcuts. These handy shortcuts include Creating Existing Shifts, Creating & Applying Shift Templates, and Copying Weeks. The Existing Shifts feature allows you to pre-load types of shifts that occur regularly in your business, enabling you to add them to your rota in just a few clicks. 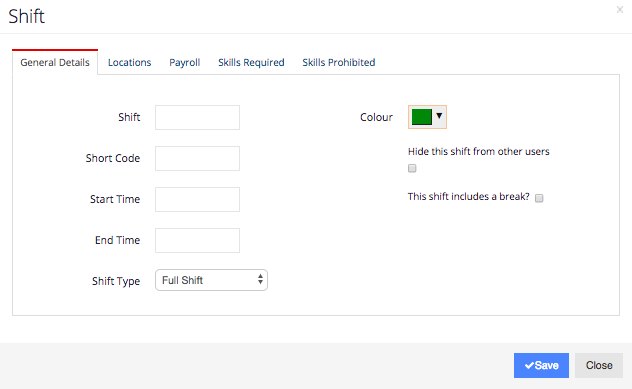 If you need to edit any Existing Shifts, simply click the orange Edit button for the shift you want to change. This will launch the dialogue box where you can amend the shift information as required. If your business has a staffing schedule that follows a clear pattern or recurs frequently, you may wish to create a Shift Template to make scheduling faster. Templates allow you to create a shift pattern for a whole week at a time, and then apply it to The Scheduler as many times as required. To create a new template, head to the Templates tab on the menu bar. Click on the green Add New button which launches the Template Editor where you can build your rota Template. Each row of the Template Editor corresponds to a working week for one employee. To add a row, simply click Add Row. To add shifts, click Add Shift and then drag and drop the required shift into the rota. If you want to edit the shift details, simply click on the information to change it. You can apply Templates to all or a select number of locations in your business. To edit an existing Template, just click on the orange Edit button. Once you've created a template, you can apply it to your chosen week(s) in The Scheduler. Do this by clicking Tools and then Apply Shift Template. This will launch a dialogue box where you can choose which Template you want to apply. Each row represents a working week for one team member. Use the left hand drop down menu to assign each row to a different person in your team. You can vary who you assign each row to each time you apply the template, helping ensure fairness amongst the team. You can also rotate shifts around staff automatically by switching on the Rotate Shifts Each Week button located at the bottom right of the template window. When this is switched on, the different shift patterns will rotate through your team members each week. If you have 8 rows in your template, you have 8 possible shift patterns each week. This means that the shifts rotate on an 8 week cycle. I.e. the next time Employee A will work the same shifts they worked in Week 1 will be Week 9. You can assign employees to every line of your template, or leave your template part filled. Where a template is part filled, only the filled part will be added to the scheduler. If you can't view the screenshot clearly please zoom in! If you want to give a whole week's worth of shifts to another employee, the Transfer Shifts Tool is a great time-saving feature. Instead of moving each individual shift one by one, simply click Tools and then Transfer Shifts. This will open a new window. In this window, simply choose which employee's shifts you want to transfer, as well as the employee you want to give the shifts to. If the employee you are taking the shifts from has left your business or transferred to another store, you can transfer all their future shifts to another team member. 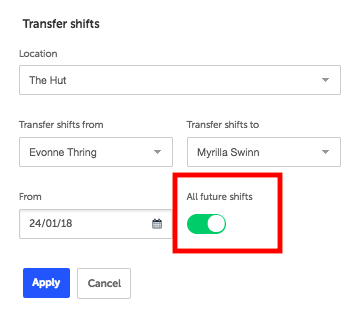 In the Transfer Shifts window, simply turn on the All Future Shifts button. Finally, click Apply and the shifts will now appear next to the employee you transferred them to. If you've built a rota in the Scheduler that you'd like to apply to another week, you can copy it across multiple weeks. In the Scheduler click Tools and then Copy Rota Across Multiple Weeks. Choose the Location to copy, which employees to include, the weeks you want to copy the rota to, and the recurrence pattern.